There are many sportswear brands to choose from when it comes to creating branded custom apparel. At the moment, the best sportswear brands are Nike and Under Armour. Plus, they are also the best custom corporate apparel brands to pair your logo with. Now the questions is which one is better: Nike or Under Armour? We’ve got you covered when it comes to Under Armour vs Nike products. Nike is one of the leading sporting apparel company in the world. They design and manufacture a variety of performance wear and accessories for running, training, and outdoor sports activities. Similarly, Under Armour also manufactures and sells athletic wear. Under Armour is a new player in the market, and they are quickly catching up and growing in stature. Under Armour outfits athletes with the most technologically advanced custom apparel and accessories for athletes and for atheleisure. As noted above, Under Armour and Nike are the part of the top 3 sportswear brands. Wondering which is better sportswear brand that is better suited for your team when choosing custom corporate apparel? We’ll be going over Under Armour vs Nike product quality, fabric, pricing, color selection, and how many styles are available/offered in their corporate apparel line to help you choose which sportswear brand is most suited for you and your team. First, we’ll compare Under Armour and Nike performance t-shirts! Performance tees are a staple in all sportswear/athletic wear line. They are highly breathable and are able to wick the sweat away keeping you dry, cool, and comfortable. Plus, they’re also great for Causal Fridays at the office, physical labor jobs (to keep your team comfortable while working hard), or just for everyday wear. As for the overall quality of their workout shirts, Under Amour and Nike are on a similar level. Both have the best training shirts that are the perfect blend of style, comfort, and performance. The Under Armour locker tees are made with 100% polyester UA tech™ fabric that is quick-drying, ultra-soft, and has a more natural feel for unrivaled comfort. For more information on Under Armour’s fabrics, check out the UA’s fit and fabric guide. Meanwhile, Nike performance shirts are made with 100% cotton or 65/35 cotton/poly Dri-FIT fabric. Nike Dri-FIT shirts wick away sweat quickly so you can more comfortably work harder, longer. As for the price range, there is not much difference, but Under Armour’s price is slightly lower than Nike’s. Under Armour’s locket t-shirt is $20.69 while Nike’s DRI-Fit shirts is $28.49 (from the tier pricing of 1-11 pieces). Both Nike and Under Armour performance shirts are available in many colors. Under Armour also has an updated version called the “Locker Tee 2.0”. Each style is available in long sleeves, as well as it is available for in women’s styles. Nike performance tees at NYFifth are available in two different styles: Core Cotton and Cotton/Polyester. Each is available in long sleeve versions, as well as for women. 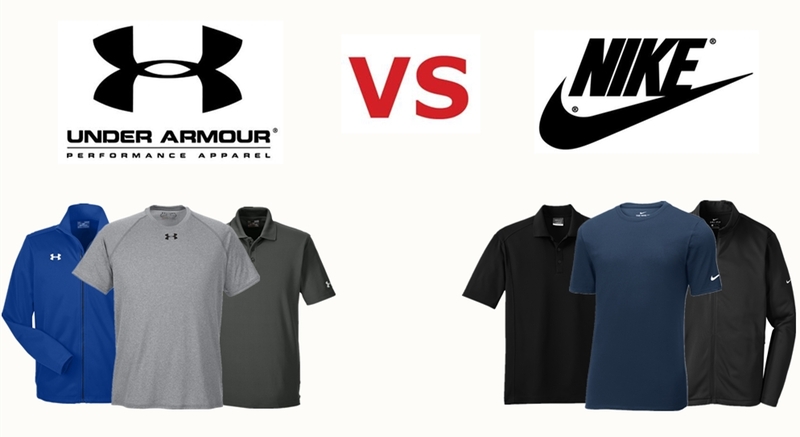 The next Under Armour vs Nike category we’ll be going over is performance polo shirts! Performance polo shirts, or golf shirts, are great team uniforms (whether in the office or on the golf course) as they will keep your staff or team looking professional while remaining cool and comfortable. Under Armour custom polo shirts are made with soft anti-pick, anti-pill fabric or HeatGear® fabric. Under Armour’s HeatGear® fabric not only wicks moisture, but also regulates body temperature so you feel cooler, drier and lighter. The Nike polo shirts available at NYFifth are made with the same Dri-FIT technology to keep you cool and comfortable all through the day. There is not much difference in their price range, but Under Armour’s price is slightly lower than Nike’s. Under Armour polo shirts are as low as $29.99 and can go up to $55.00. Nike’s polo shirts price ranges from $35.00-$75.00. Both Under Armour and Nike performance polo shirts have many color selections to meet the needs of all kinds of team uniforms. Nike, on the other hand, has a a wider variety of polo shirts for men and women compared to Under Armour. The last Under Armour vs Nike category we’ll be comparing is their outerwear collection! Performance jackets are essential for the low temperature when you’re training or enjoying outdoor sports activities. They also make great team jackets when you add custom logo embroidery or screen printing — which will give you and your team a more professional and united look. At the moment, our Nike outerwear collection only has fleece pullovers and full zip fleece while Under Armour has a variety of jacket styles to choose from (rain jackets, 100% polyester, soft shell, etc.). Under Armour sports jackets are made with water-resistant polyester or nylon fabric, and features Moisture Transport System, or UA Storm® and ColdGear® technologies. Under Armour jackets are designed to be lightweight but durable enough to enjoy your favorite outdoor activities comfortably. Nike fleeces are made with polyester Therma-FIT fabric keeping you warm, insulated, and light at any cold weather activities. Nike’s Therma-FIT is made of double-brushed microfiber fleece that retains energy and resists heat loss. It provides maximum insulation from cold and wind with minimal weight and bulk and is ideal for any cold weather activities. Nike’s fleece jackets and pullovers range from $66.00 to $80.00, while Under Armour’s collection of outerwear ranges from $30.00 to $150.00. Under Armour does have a wide variety vs Nike, so that’s why the price range for Under Armour is a bit more. The more expensive outerwear jacket from Under Armour are jackets styles like puffer jackets, soft shells, and 3-in-1 system jackets. Under Armour jackets have many color varieties that are more appealing to the young people. Nike fleece jackets are just available in a few classic colors. Looking for custom corporate apparel decorators? We can be your corporate apparel decorators as well as we provide imprinting services as well! We strive for customer satisfaction, as well as offer bulk discounts and fast turn around. For a free quote, talk to a friendly customer representative today at (877) 695-9722 or email us your inquiry at support@nyfifth-inc.com.